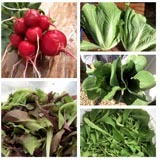 EverGreen Farm CSA memberships for the 2009 season are now available for purchase. We can only offer a limited number of farm memberships, which will be sold on a first-come, first-serve basis. Please sign up ASAP. We sold out last year in about one month. Jackson shares sold out even sooner. The cost is $550. A down payment of $150 will reserve your membership. Final payments are due by April 1, 2009. For more information, please refer to our 2009 sign-up sheet, the many previous entries on this blog, send Tara an email, or give us a call. Here's what you need to do to sign up: download a copy of our sign-up form, fill in your contact information, keep a copy of the form for yourself, enclose your payment (or pay by credit card below), and mail in your paperwork. Please send us a completed sign-up form even if you pay by credit card. We also have a Farm Workshare Program for people who like to play in the dirt and will literally work for food. You can learn more about this by reading the 2009 Workshare contract. If you are having any troubles downloading these forms, please contact Tara ASAP. I have set up two PayPal payment options for those who would like to pay for their membership by credit card. Again, I urge you to sign-up quickly. I will post a notice on this website when memberships are sold out. Any late sign-ups and payments will be returned. Thank you so much for your support. We are looking forward to another great year! As mentioned in other posts on this website, EverGreen Farm will be making some changes in this coming 2009 season. Specifically, we have decided to concentrate our farming efforts on growing great produce for a select number of customers: our CSA members, the Jackson Hole Farmers Market, folks who wish to buy directly from us on the farm, and a few local grocers and restaurants. Unfortunately, there are just not enough hours in the day, days in the week, or farmers on this farm, to expand our business to meet all the requests from good people who want to buy our food. Thank you for understanding. If you are a regular shopper at the Jackson Farmer Market, stop buy our stand. We have big plans! You won't be disappointed. Please do not compare your weekly CSA share to the produce you see us selling at the market. The Farmers Market and CSA are two different aspects of our business. Each requires a different approach to be successful. This is not necessarily obvious from the consumers point of view, especially when there is good food at stake. Thank you for understanding. With more than a foot of snow on the ground, twenty thousand dollars of prepaid expectations, and my commitment to deliver the world’s best produce, I panicked when the first week of April arrived. Through the triangular windows at the south end of my second-story loft, I witnessed the beauty of a cold blue sky pressing down on the plastic coverings of the two greenhouses just south of our home. Then, I nervously chuckled and quickly turned the pages of last year’s farming journals, desperately scanning for anything to give me hope. “What was I thinking when I started to farm five years ago?” I muttered to myself. May brought just enough heat to melt the snow and a little of my pessimism. After two weeks of dry weather, my garden begged for seed. The ground appeared dark, lightly moist, and not too soggy. With one pull, my blue BCS Walking Tractor steadily rattled to life. To imagine this machine, think of a garden tiller on steroids—two eighteen inch diameter tractor tires, a fourteen horsepower motor powering a thirty-inch wide tiller box, and two long handlebars with enough levers and knobs to resemble the cockpit of a World War II fighter plane. I grasped the clutch, put it into third gear, and made my way to Garden #3 just north of my home. Approaching our garden, I eased the tractor into low gear and engaged the tiller. The tines gently churned the soil six inches deep. It felt just right, loose, fertile with humus and life, and most of all cooperative. That day I tilled a fifty-foot wide by three hundred foot long patch of garden. The ease of cultivation allowed me to pay less attention to guiding the tractor and more to my surroundings. While working, I surveyed the hills to the east and west hills of my home, each being only a mile in either direction of our 7-acre farm. We live in a beautiful location—a narrow mountain valley with an exceptional view of the alpine landscapes of the Bridger and Caribou National Forests. Understandably, my chore was pleasant. After working this small section of land, I quickly unrolled several lines of drip-irrigation tape. Then, I fitted the ends to their valves and secured the tape into long straight lines. Next, I dusted off my Earthway Seeder, attached the appropriate seed plate, opened a seed envelope, and deposited my hopes into the hopper. Grasping the handlebars of my human propelled seeder (an aluminum frame with a red box, rubber belts, and plastic wheels—something I imagine appears toy-like to my neighbors) I carefully passed each side of the drip line. On that first day of planting I sowed lettuce, carrot, beet, pea, cilantro, turnip, radish, and parsley seeds. Between rainstorms, when the ground hinted that it might possibly be dry enough for transplanting, Tara and some workshares (people just as crazy as we are who will literally work for food) punched holes into the cultivated garden beds with hand-held ironwood dibbles. Afterwards, they transplanted kale, chard, cabbages, and Bok choi. This is backbreaking work. Dressed in work pants, gardening gloves, and rain gear they knelt in the dirt, or sometimes mud, all day long carefully sliding into the soil baby seedlings started earlier in the season. To imagine what they looked like when finished, picture a motocross racer caked in mud. Then, replace the thrill-seeking grin with a “what-the-hell have I got myself into” expression. Mid May continued with a deluge of rain. Periods of four and five days of heavy, dark grey skies weighed on my hopes of planting our crops on time. The ground was simply too moist. So, we spent a lot of time in our four dry greenhouses. Tara and I transplanted tomatoes and then interplanted them with basil. This chore has its rewards. Inhaling the sweet licorice/mint aroma of basil gave me a sensation I can only describe as clean. The cavity of my entire skull felt as though it had been scrubbed. Later that very day, rain gently pattered on the greenhouse plastic that protected both us and our plants from our region’s extreme weather. The clean scent of spring rain filled and cleared my lungs. Meanwhile, outside clouds blanketed the pines on the West hills and a single beam of sunlight framed my view of Star Valley just right. At that moment I paused because my heart was full—farm work can be truly idyllic. After planting, we hooped the rows of tomatoes and basil with eight-foot sections of heavy gage wire and then blanketed them with thick row covers to prevent the cold, damp nights from stunting their growth or killing the plants all together. To some our efforts to grow fresh food might seem Herculean—tomatoes grown undercover inside plastic covered cold frames. Nonetheless, this is the only way to grow heat-loving crops in our northern mountain valley. During these rainy days we also hand sowed fillet beans, transplanted cucumbers and peppers, cultivated and weeded inside our plant shelters, and prayed for dry weather. When nature permitted, we transplanted squash, broccoli, and cauliflower outside. At the end of May we planted more crops outside: beans, 4000 row feet of potatoes, and succession crops of more carrots, beets, and lettuce. After another week of constant drizzle, the weather turned colder, and it snowed June! Not wimpy snow either, but fat, moist snow flakes which plummeted to earth in waves blanketing our farm in several inches of despair. Normally, I love snow. It is beautiful, that is unless it’s June when I have people to feed, row covers that will collapse and crush the plants they are intended to protect, and too much work to do in too little time. In an attempt to prevent all these problems, I dusted the snow off at least a dozen row covers with a broom, straightened the bent hoops supporting them, and re-secured the thin, white fabric made to protect our crops from the extreme cold that usually follows a June snow. This took all day! Extremes continued into the middle of June. As fast as turning on the lights, the heat turned up, and it definitely came too fast! After one or two minor harvests of radishes, turnips, cabbages, and Asian greens, these crops bolted (bolting is a gardening term used to describe how a cool-weather crop, when triggered by heat, begins to seed, turns bitter, and is no longer suitable to the experienced palate). Remembering a local folk tale, I amused myself by recalling a story of how this area was named. The long winters, non-existent springs, short-intense summers, and artic-like falls caused some early settlers to starve. My valley was, therefore, originally called “Starve Alley.” Sometime later, after a particularly hard winter it was rumored, some optimist cleverly rearranged a few letters and changed the name to Star Valley. I like to imagine it made him feel better about living here. In July our crops sprouted like Jack’s magical bean stock. Vegetables will grow in Star Valley when it’s warm. Unfortunately, once the produce began to grow in earnest every caterpillar in Lincoln County, Wyoming seemed to get word of our quality organic food. I believe the story of one crop, our salad mix, demonstrates the struggles we faced this year. Please don’t get me wrong; harvesting salad, usually a manageable chore, can be pleasant. This year it was not. In 2008, making our gourmet salad mix went something like this. First, I searched our fields of salad for sections of greens that appeared to be “bug-free.” One easily recognizes where an infestation has occurred because lettuce plants look limp and nearly lifeless. When harvestable greens were found, I carefully cut them. While carefully brushing the bottoms of the harvested plants, I searched for caterpillars, and once the guilty were discovered I delighted, I must admit, in squishing them between my fingers until they exploded. Next, I dropped the now presumably bug-free salad into a five-gallon bucket. I repeated this one handful at a time until I filled my bucket to its brim. Returning from our salad fields, I handed over the fresh-cut greens to Tara and our workshares. Their job was to submerge the lettuce leaves in ice-cold water, gently agitate them, and again, one handful at a time, search for bad lettuce and bugs. They repeated this process twice for every batch. After duplicating this procedure another six times with other lettuce varieties, we had enough greens to make our salad mix and hurry to the next job. With the help of a half-dozen workers we normally harvest and process forty pounds of greens in the course of a single morning. Add a caterpillar infestation, and the time required to provide quality greens increases to almost an entire day. In spite of all this hoopla, some bugs still snuck through. Needless to say, this caused us some anxiety and loss of sleep. In our area farmers markets start in July. Usually, the beginning of the market season is a happy event for us because we renew friendships with long-time customers and visit with many of our Jackson Hole CSA members. Their smiles and comments boost my ego. 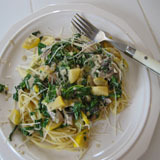 “Your food is soooooo good that I believe I would have to move if we didn’t have your farm,” one CSA member remarked. A market client latter pronounced my personal favorite, “Come buy these carrots, they’re addictive as crack!” She sold a lot of produce for us that day. To my dismay, The Jackson Hole Market, which financially is an essential part of our business, began only one day after The Fourth of July. Consequently, the renewal of our friendships was bittersweet. We are close to our extended family and use any excuse to get together. This is even truer on holidays. Family traditions—swimming in a snow fed lake, fly-fishing, and a big barbeque—were interrupted to accommodate our first market of the year. orchestra camps. She truly is an amazing girl. Raising children on a farm is a blessing because, as you can see, our children are busy, so much so there is not a lot of time for them to find any real trouble. Trouble for children at EverGreen farm is not doing chores correctly. Trouble for Saberon children is not sufficiently pulling their fare share. Because of this, I feel they appreciate and relish down time for reading and practicing music. Megan works hard at school and the violin. So hard, in fact, my daughter’s violin teachers are sure her college education will be funded by and include a lot of violin. I see this as another incredible benefit of farming. Raising children on a farm also has its challenges. One downside to this arrangement is our lack of time for things deemed important. This year the weather-related delay put us behind on planting. While catching-up on seeding and transplanting, we gave the weeds a generous head start. In fact, we presented them such a large advantage that we never approached catching up. As a result, conflicts in priorities arose. First, I made the regrettable choice to miss one Megan’s chamber orchestra performances. I heard she played beautifully. Additionally, I sacrificed opportunities to camp and fish with my son. On one occasion where I set aside enough time to spend a day and a half with him, I was richly rewarded. After a short day of work, Eli and I packed and headed for Tin Cup, a small stream north of our home just across the border into Idaho. On our way, we stopped to stock up with junk food, an exceptionally rare event. Eli declared, “This is a darn good break from all that healthy farm food.” Our cooler, I must confess, had nothing healthy in it—pop, chips, brats, and all the ingredients for smores—enough junk I feared to put my body into a sugar induced coma and my son’s into an uncontrollable high. After arriving at our destination, we set up camp, started a fire, ate, and then began to have some “manly” fun. Empty Grape Shasta pop cans are reusable in many ways. Before sending them to the recycler, I suggest hanging them from tree limbs as targets. I loaded Eli’s Red Rider BB-Gun with more than one hundred rounds (surely enough, I incorrectly presumed, to last the evening). He shot those pop cans in every conceivable way—point blank, from five paces, then ten, and stacked two-high to see if one could be knocked off without tipping the other. For more than an hour I lounged in my camp chair nursing a junk food hangover while I observed the amusing phenomena of a boy with his first gun. The months of August, September, and October are both bountiful and complicated for us. It’s the end of summer, the beginning of school, and the commencement of fall. This fall there was a lot food to harvest, a lot of market demand, a lot of personal food preservation, and a lot of hard work. Like many farmers, I have another full-time job. I teach eighth grade English and love that profession as much as farming. Wearing many hats—that of the farmer, the teacher, the father, the husband—is not impossible for me. But, my ambitions to make a real difference in this world push my wife, sometimes to her limits. I love and admire her. Tara is beautiful, humble, hardworking, talented, and family centered. My perfect mate. This is what I know of her day. Wake-up at six a.m., prepare breakfast for Eli while he and I practice piano, review our plans for the day, and send the family off to school. Next, milk goats, organize and complete farm work for more than fifty CSA shares, harvest food for multiple grocery store and restaurant accounts, prepare for the farmers market, deliver produce, sell produce at the farmers market, maintain a farm blog, research farm related business news and laws, and manage the farm and family finances. Then, help Eli with homework when he returns from school, wash laundry, eat dinner with the family, manage children and a husband, maintain contact with her parents and siblings, write letters to my grandparents because this means so much to them, take time to attend violin and piano recitals, read, and pay some attention to her husband so we can maintain our relationship. That’s quite a list! This year has taken a toll on Tara’s physical and emotional well being, my patience, and our children’s needs. I do not consider either of us to be old. But, judging by our aches and pains we are, I must admit, aging. What we sometimes see as the hardships of farming can also be considered insights, and this only happens when we choose to look at life through an optimistic lens. These discoveries are pearls of wisdom that steer us to reshape our plans and designs for a better future. Hopefully, this will allow us to be more healthy and happy. So, like one of the original settlers of my valley, I will change the “Starve” to “Star” and a fool and optimist be. Some changes as to how we operate our farm have to come. Stay-tuned for more information!